The Kroll Dual Voltage dehumidifiers combine very large extraction rates with high quality materials to give industry leading performance. 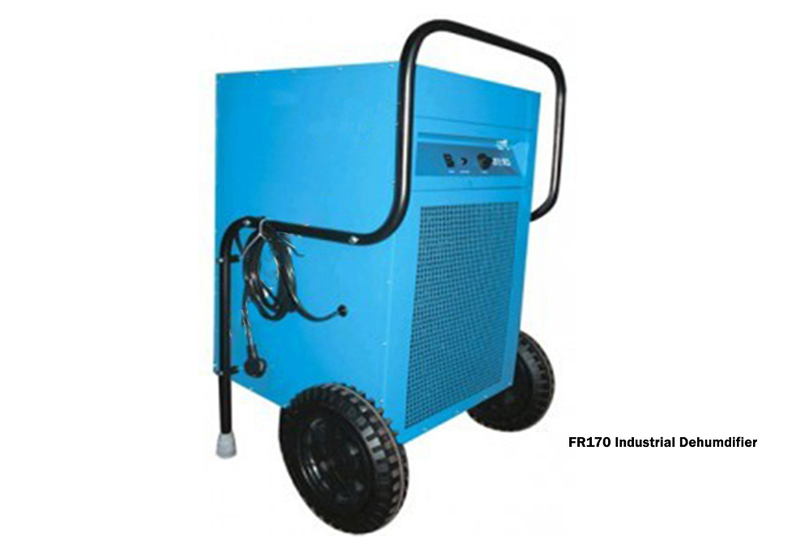 These rugged and reliable units use tough steel bodies and powder coated finishes to take the knocks associated with regular site use while the reduced size and weight help you maximise transport and storage space. 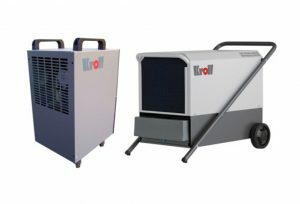 With their unrivalled versatility these Kroll dual voltage dehumidifiers are a popular choice throughout the hire and flood restoration industries where they help reduce the speed of drying times and reduce water damage. The come as standard with hours counters and are available in either dual voltage or 230V only (please see our TE range of Dehumidifiers) we also offer a full range of accessories including hour condensate pumps and humidistat’s. Perhaps the only range on the market to be designed specifically from the customers point of view, the Kroll Dehumidifier is a result of decades of experience in dehumidifier manufacturing not hours of internet research into cheap imports, as you would expect from a German manufacturer. Kroll dehumidifiers are designed, engineered and built to give value for money by offering unrivalled reliability with a tough steel case to take the knocks of industrial use, compact sizes that won’t take up the whole van and powerful extraction rates to minimise drying times. They’re fully serviceable with full spare parts availability and backed up with a 2 year warranty. Dehumidifiers give maximum results at around 30C so adding extra heat can aid the dehumidification process and reduce drying times, please use a Kroll electric heater, as they do not added any moisture to the air , or a Kroll indirect warm air heater as these heaters also add no moisture to the air. 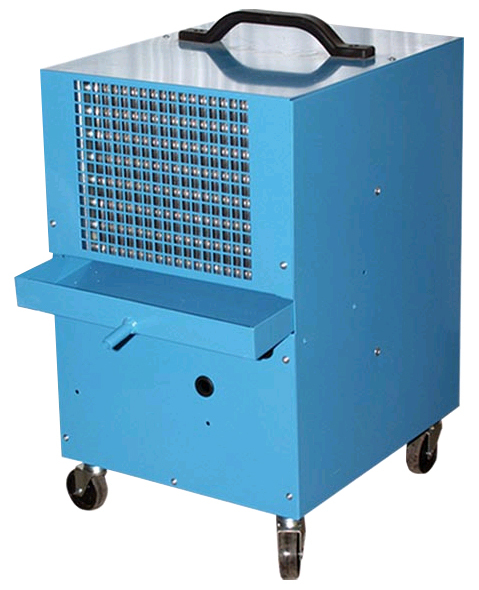 We now also do a range of 110 Volt dehumidifiers and portable dryers that are ideal for construction sites and hire companies that are UK produced. 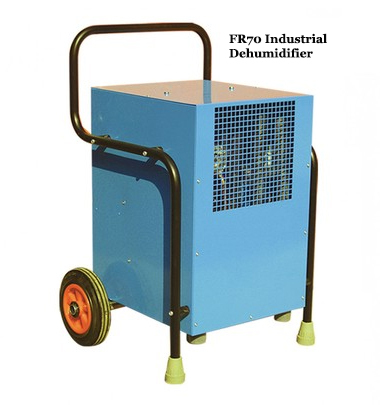 In reality they are dual voltage dehumidifiers, so you have the flexibility to choose your preferred electrical supply, but as most building sites insist on a 110 Volt supply these days, you’ll probably find that these dehumidifiers spend most of their time in that 110V supply mode.These rugged and reliable 110v dehumidifiers are the perfect tool to eliminate damp or help dry out building works such as plaster,concrete etc, enabling the customer to finish or complete the works quicker.All of this range of 110v dehumidifiers can have optional extra’s such as humidistats, condensate pumps and hour counters fitted to the units should they be required. Our largest unit the FR170DV comes with all of these extras included as standard.